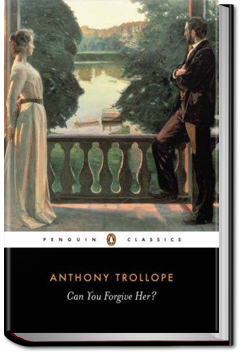 “Can You Forgive Her?” is the first in a series of six Trollope novels dealing broadly with 19th Century English political scene. It introduces the reader to Plantagenet and Glencora Palliser, as they court, marry, and as Plantagenet sets out on his political career, which is carried on in the foreground or background throughout the series. Each novel has a focus on other particular characters, as well. In this one, it is the dilemma of Alice Vavasor, who is a young woman choosing between two suitors: one who has all the best qualities, but who prefers a retiring private life, and another, whose qualities are doubtful, but who is ambitious for public office. There is also a comic subplot involving a widowed aunt, who also must choose between two suitors: Mr. Cheeseacre, a dull but stable farmer, and Capt. Bellfield, a charming but somewhat erratic retired military man.